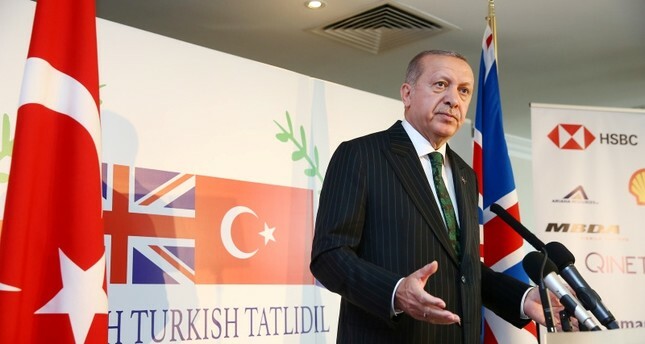 President Recep Tayyip Erdoğan started a three-day visit to Britain by praising the country Sunday as "an ally and a strategic partner, but also a real friend." Speaking at the Turkish-British Tatlıdil Forum, Erdoğan noted that in July 2016, the British government quickly condemned the Gülenist Terror Group (FETÖ)-orchestrated military coup attempt and said "we will never forget this solidarity." The president said bilateral cooperation between the two countries has grown, especially since recent referendums changed Turkey's governing system to an executive presidency and Britain opted out of the European Union. The deepening ties are most evident in trade, Erdoğan said, with a joint goal of increasing trade volume from $16 billion to $20 billion and a potential free trade agreement in the works. He cited British-Turkish cooperation in defense industries as an example for more new ventures. "Trade has always been a locomotive in our bilateral relations, in the last 15 years the U.K. has invested over $15 billion in Turkey, that is a sign of trust," Erdoğan said. In a news conference held at Istanbul Atatürk Airport earlier Sunday, Erdoğan said he will be discussing bilateral, regional and international issues, including the latest developments in Cyprus and the Middle East, especially in Syria, Iraq, as well as the nuclear deal with Iran, also referred to as the Joint Comprehensive Plan of Action" (JCPOA), with the British prime minister. According to media reports in the U.K., May's official spokesman said the visit is an opportunity for the two countries to demonstrate their close bilateral relationship and to have important discussions about issues of shared interest. The president's three-day visit is also expected to focus on enhancing trade relations between Turkey and the U.K.
"We want to continue our economic relations as the governments of Turkey and the United Kingdom without interruptions after Brexit," Erdoğan said. Erdoğan is expected to meet the CEOs of U.K.'s major companies and invite them to invest in Turkey. The president will also be speaking at think tank Chatham House and meeting investors.